Please Visit My New Etsy Shop! I was laid off from my editing job a few months ago and so I've been trying to find some way to contribute to the world as well as financially help my family. I've applied for some writing/editing positions to no avail, but I've been also try to explore other options. One thing I'm doing is selling items on consignment on Ebay. My friends are always trying to reduce their number of material possessions, but they are also very busy women. This is a way I can be of service to them as well as make both them and me a little bit of money. I'm just starting out, but so far it is going well. The other thing I've been doing is trying to get back into my art. I've created some altered books recently as well as started painting again. I love art, but I find it hard to justify in my life. My quilting ultimately serves a useful purpose - it keeps the user warm. Paintings that end up stored in a bag in my bedroom just haunt me. 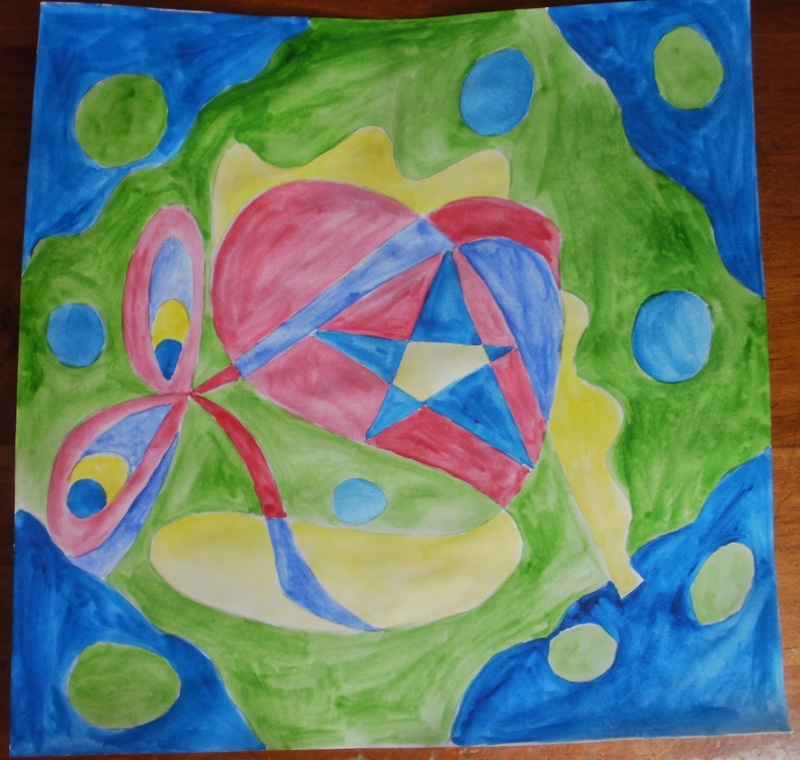 But with the advent of Etsy, I thought I might give selling my art another try. In my shop, I have many watercolors I've done over the years, as well as some photographs available for download, and my new altered books. I'm also happy to take requests. Please take a look around the shop and consider sharing the link with your social networks - Thank you! I usually try to do something special with this blog during Lent - it offers a spiritual exercise for me and hopefully some of you out there benefit from it as well. In my parish library, I recently picked up a 1976 book on The Writings of St. Francis of Assisi translated by Benen Fahy, O.F.M. with Introduction and Notes by Placid Hermann, O.F.M. I wasn't able to find the same book on Amazon although there are certainly plenty to choose from about St. Francis. I truly was not aware that St. Francis had written so much and have found much to think about in reading this book. In light of our current pontiff and the continuing call to live a more simple life, I thought I'd reflect on the words of St. Francis this Lent. Starting Ash Wednesday next week, I'll be offering quotes from this famous saint. I hope you find them interesting and that they help you on your Lenten journey. The Waltons television series, which focused on a family living in the Blueridge Mountains of Virginia during the depression and World War II, began before I was born and ended when I was a little girl, still too young to stay up at night to watch the primetime episodes. Yet, I had the great pleasure of enjoying many moments watching the show in reruns as I grew up. Even as an adult, I still enjoy watching a few episodes once in a while, reliving the old memories. Goodnight John-Boy by Earl Hamner and Ralph Griffin is a look behind the scenes of this television classic. The show was based on Hamner's own family, where he was the oldest of eight children growing up in Schuyler, Virginia. Hamner shares many photographs of his own family as well as the story of his own writing career and how the Waltons series came to be. The book then offers a short synopsis of every Waltons' episode as well as special reunion movies that came after the series ended. This section includes wonderful anecdotes from the actors, writers, and fans. The last portion of the book focuses on the Walton's Mountain Museum. 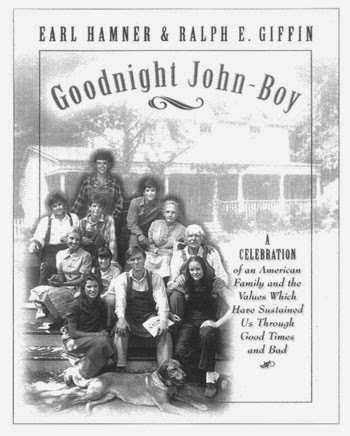 Goodnight John-Boy will be enjoyed by any Waltons' fan who wants to know more about the stories behind the show. Before it can look beautiful, it must look a wreck. For many of us, this is not just a matter of looking, but being. We can't say if it "has to" happen, for who but God knows the answer to that, but most of the time, that's the way it is, isn't it? The moments of most intense life and communion with the Lord follow the moments when we have been worn down to the bone. Healing Lord, I trust that you can heal me and make me new. David is in 7th grade this year (how is that even possible?) which means that high school is looming heavily on the horizon. He knows his chances of success in a traditional high school aren't good, he wants to be homeschooled for high school and I'm happy to do it. The problem? All of his friends are going to traditional high school. We've been blessed with a great group of friends to travel this homeschool journey with and I know that it is possible for them to stay friends (one of my best friends is someone I went to school with from 2nd - 8th grade), but the reality is that people tend to associate with the people they see on a daily basis. He doesn't want to have a friendless existence and I don't blame him for that. People, especially teenagers, need friends. He does have extra-curricular activities he enjoys, especially his drama classes. I know that there will be increased opportunities to volunteer places once he is in high school, and maybe, if all the stars align, he can get a job when he is sixteen. But, will it be enough? Will he have friends? I look at the high school options and wonder . . . and I have no idea what to do. We have about a year to make a decision. Lots of prayer is in my future. Lots of prayer is always in my future, and in my present. God has a way of always keeping me on my knees. This article offers advice teachers of kids with Aspergers and it is a good one: http://www.myaspergerschild.com/2014/02/understanding-your-difficult-aspergers.html , but I read through all the issues and my heart sinks. We've been fortunate to homeschool, to minimize the stress somewhat, although certainly not totally. Today was the first day back to school after a week vacation. Can we say meltdown central? But, we got through it, and tomorrow is another day. How would that possibly work in a traditional school setting? For now, I have more questions than answers and there are no easy solutions. When I was in college, a favorite professor offered a literature class called “Mothers and Daughters.” As I read The Painted Table by Suzanne Field, I couldn’t help but think that this book would make an excellent addition to that class syllabus. Mother/daughter relationships are always complex. Add in the specter of mental illness and the strain can become unbearable. Such relationships are at the core of The Painted Table. When the story begins, Joann is a seven-year-old girl living in North Dakota. While her siblings believe their mother, Clara, died as a result of childbirth, Joann discovers the truth – that their mother died in a hospital for the mentally ill.
Joann ultimately leaves home and builds a new life with her husband, Nels. They have two daughters, Sapphire (Saffee) and April. The story from that point on is told from both Joann and Saffee’s perspective. Joann struggles with her demons and Saffee tries her hardest to survive and distance herself from her mother as much as possible. Her greatest fear is that she will end up just like her. In addition, Field explores the theme of objects in our lives and the meaning and weight that they can carry. The Painted Table referred to in the title was originally made in 1858 in Norway and later traveled to America. Joann would hide under it as a little girl. In many ways, it became her safe zone. Yet, it also carried horrible memories. 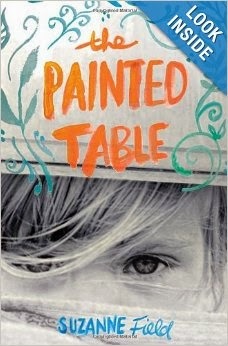 When her older sister dies and the table makes its way to Joann, she is determined to exorcise its hold over her by covering it with paint over and over again. For Saffee, the table holds nothing but horror, yet, she, too, ultimately ends up its owner. Can she break free of the table’s legacy and all it represents? The Painted Table is a series of short vignettes in the lives of these two women, which cover a great deal of chronological time. The story is strongest in the latter half of the book when Saffee is an adult. It’s definitely worth sticking with the story to get to that point. The Painted Table offers much to think about and discuss, especially for those who have experienced mental illness in their families. It would make a great book club read; there is a short reading group guide included in the book for exactly that purpose. The old adage says never to judge a book by a cover, but, for better or worse, a cover is frequently what gets our attention. 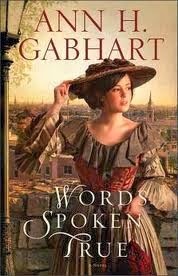 I got my copy of Words Spoken True by Ann Gabhart at the library where it had the cover on top, featuring a journal, quill and flowers. I've read other books by this author and enjoyed them so it did have an advantage in that regard, but the cover intrigued me as well and invited me to open the book. When I did a search tonight on Amazon prior to posting this review I discovered the cover below which features an image of the heroine Adriane Darcy. Something about this cover just shouts "cheap novel" to me and I probably wouldn't have taken the time to read it. That would have been unfortunate as I really enjoyed the time I spent with this book. Words Spoken True is a historical romantic mystery which takes place in Louisville, Kentucky in 1855, a time of great political turmoil. There were several newspapers in Louisville at that time, many of which had a political agenda. The American party, also known as the Know-Nothings, was hard at work trying to limit opportunities for the new immigrants coming to America, especially those who were Catholic. Adriane Darcy is a young woman who grew up working on one such newspaper under the father's direction. At her father's wishes, she is engaged to Stanley Jimsom, the son of an influential Know-Nothing politician running for office. Adriane tries to make herself obey her much-loved father even though the thought of a life with Stanley makes her ill. In addition, she's recently met Blake Garrett, the editor of a rival paper whom she can't seem to avoid or get off of her mind. In addition to the electoral turmoil, there is a serial killer on the loose, preying upon young Irish women. While all are concerned, Blake is determined to discover who did it. This is a fast-moving novel with several interesting story lines. It depicts a strong career-minded woman struggling with her place in society, offers a lesson in political and social history of the era, as well as provides both an engaging love story and mystery. Well-done! This highly acclaimed multi-media presentation will be held in the Catholic Newman Center located at 472 N. Pleasant Street, Amherst, MA on Monday, March 10th at 7 pm. A rare, museum quality life-size replica of the shroud will be on display. Admission is free. A Rosary Novena is my go-to prayer when life is challenging and I have something extremely important to pray for. I highly recommend it. It is fifty-four days of praying the rosary with accompanying prayers - the first three sets of nine days are petition with the last three sets being said in thanksgiving. I'm on day 42 of my current novena. I always find it somewhat difficult to say the prayers of thanksgiving when I haven't yet received an answer. I tend to still phrase those prayers of thanksgiving as prayers of petition except that I start them with "Thank you." I know God answers all prayers. I know God has a plan. Trusting in all that is much easier said than done. Yet, there is something powerful in those words; "Thank you." I try to remember to say them daily to God, but I don't remember as often as I should. I tend to see the negative in life more than the positive - something I definitely need to work on. Save the date and register today! Lisa Hendey, the Founder and Editor of www.CatholicMom.com and the author of three books, including The Handbook for Catholic Moms and a regular radio guest and the host of the television program "Making the Grade", is coming to Western Massachusetts for the Diocese of Springfield Catholic Women's Conference on Saturday, April 26th, 2014. Sister Eleanor Spring, who was born and raised in Springfield, entered the Sisters of St. Joseph of Springfield in 1964 and will be celebrating her 50th year as a member of this religious community in 2014. She os employed by Western Mass Regional Women’s Correctional Center as Group Facilitator. She acknowledges that working with incarcerated or post-incarcerated women is her passion. Kerry Weber is the managing editor of America, the national, Catholic, weekly journal published by the Jesuits. Kerry worked as an associate editor for Catholic Digest magazine before moving to New York City, where she earned a master's degree from the Columbia University Graduate School of Journalism in 2009. Tess Rafferty was the recipient of “The First Phone Call from Heaven.” She received a call from her mother, who had passed away four years earlier. Several others in the small town of Coldwater, Michigan, would soon receive the same honor of hearing from a loved one no longer with them. The most vocal of these is Katherine Yellin, who received a call from her sister Diane. Katherine soon becomes the focus of a media frenzy and the small town of Coldwater becomes filled with tourists, pilgrims, and protesters. Meanwhile, Sullivan Harding, a widower recently out of jail and attempting to rebuild his life with his young son, is angered by these calls and is determined to get to the root of who might be perpetrating this cruel hoax. 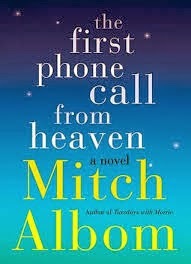 “The First Phone Call from Heaven” is an enjoyable read. Albom skillfully interweaves the stories of the various people touched by these calls from the other side. He also crafts a suspenseful detective story. He also intersperses a bit of history, telling about Alexander Graham Bell and his quest to create the telephone. What does expressing the authentic fee self look like? Not like the glossy pages of any magazine on the coffee table, for starters. The self is not self-created, but God-inspired . . . There is a "you" to be saved, apart from all the roles and titles, costumes and assigned seats in our respective generations and situations. This "you" wasn't brought into being for the vain purpose of self-expression, but the vital purpose of self-giving. The self isn't something to be tried on in the dressing room. It's nurtured within, and radiates when released. The selfhood of the saints literally glows, illuminating not simply who they are, but the light of the One in whom they are rooted. If freedom is precious to us, and by God it should be, there's no better place to begin then by learning how to be free moral choosers. Fire and water are before us, life and death, good and evil. We demonstrate who we really are as we reach for what will define us. My local newspaper ran a wonderful article on Spirit Among Us - a Catholic Book / Gift store in Ludlow, Massachusetts, ran by a Deacon and his wife - as much a ministry of love and service as it is a business. Unfortunately, the newspaper didn't seem to post the article on-line and I already recycled my newspaper so I don't have much more information than that. But, I would be remiss if I didn't at least give them a plug. They are happy to special order religious books and items, and as a Deacon, the owner can even bless them for you! Please visit their website at Spirit Among Us and if you are in the area, please consider shopping there for your religious goods. 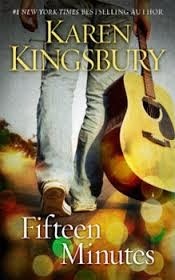 A new season of American Idol is underway which makes it the perfect time to read Fifteen Minutes by Karen Kingsbury. Zack Dylan is from Kentucky, an aspiring singer hoping to use his voice to make the money needed to save the family farm and tell the world about Jesus. He is headed off to audition for "Fifteen Minutes," a television singing competition. In doing so, he is leaving behind Reese, his longtime girlfriend whom he hopes to marry. Chandra Olson is a former winner of "Fifteen Minutes" who now serves as a judge. Her sole reason for being there - to warn others about the price of fame. Kelly Morgan is an aging beauty doing everything she can to fight the passage of time. Meanwhile her marriage has fallen apart and chasing fame has become an overriding obsession. Karen Kingsbury has produced another great work of Christian fiction. "Fifteen Minutes" is an enjoyable read - you will become deeply involved in these character's stories and want to know how it all turns out. A "False Dilemma" is also known as black and white thinking and kids with Aspergers frequently have this issue, especially when they are stressed out about something. To those who don't understand it, it can often be mistaken as pure, unbridled stubbornness. After all, you try to reason with them, provide perfectly valid and reasonable alternatives to the problem and they still insist on their point of view. It can be extremely frustrating for all involved.